On Saturday 16th June some of the WFH Telford and Wrekin walkers and walk leaders joined in the launch of the T50 walking route around Telford. The T50 route is split into various lengths of walks and is signposted all along the walks. The launch was from Town Park , one of the walk leaders did the whole 50 miles in one day!! Another run in the running relay. 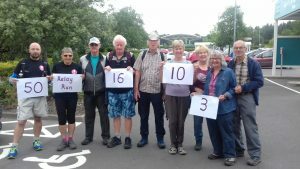 Some of our more experienced walkers did a 16 and 10 mile walks and group did a 3 mile walk around the Telford Town Park.